First published in 1986 in Stardate 11. 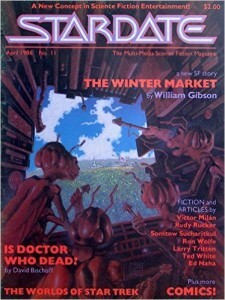 I read it in the collection The Legend Book of Science Fiction, edited by Gardner Dozois and published in 1991. Another brilliant story, but I would expect nothing less from William Gibson. I am a big fan and have read most of his novels, but not many of his short stories. I think I need to get hold of Burning Chrome, William Gibson’s first collection of short stories. Tells a story of Casey, an editor of dream experiences (?) who meets a woman with extraordinary dreams who allows him to be the editor. She and he become rich. Can’t say much more. (This is typical of short stories, the best ones can’t be summarized.) “Dreams” is not a correct description, it is a lot more than that. They are edited into products, entertainment products. The relationship between the two main characters, Casey and Lise, is interesting, because they seem to hate each other at first sight. Casey’s relationship with Rubin, his best friend and an artist, is also interesting. The way the two relationships are kept apart but run concurrently, and intertwined, is a nice way to handle the story structure.